The Sculptural Biofiltration Wall was created as an integral part of the expansion of the Seminole Coconut Creek Casino. The project is comprised of a 40 foot tall sculptural wall and a multi-level aquatic garden located in a courtyard adjacent to a new 7 storey parking structure. The Sculptural Biofiltration Wall was conceived as a living system designed to regenerate the surrounding environment by improving water quality, enhancing habitat viability, as well as informing and inspiring the public about ecological systems. The project filters approximately 150,000 gallons of water a day through mechanical and biological systems, improving the water quality of the adjacent retention ponds. The retention pond water is used for irrigating all of the vegetation on site including the parking structure green walls, and may be used for future plaza water elements, reducing the use of potable water. Harvested rainwater supplements the water system with 10,000 gallons of water storage capacity. The rainwater is filtered and stored within four tanks along the east wall of the parking structure and is planned for use in a future valet car wash. The Sculptural Biofiltration Wall fosters biological systems including plants, fish, and beneficial bacteria that naturally cleanse water. Improving water quality in the retention ponds also assists to improve habitat viability and biodiversity of the ponds. 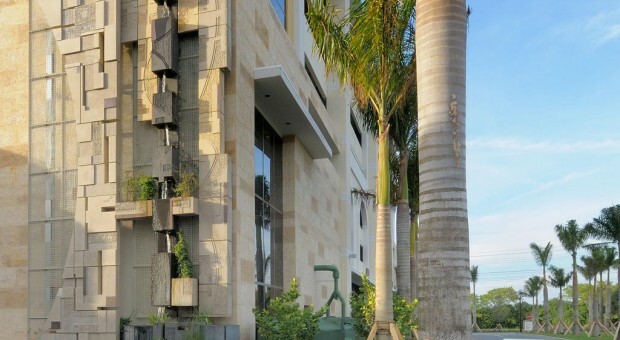 The sculptural wall itself supports a range of vegetation to attract avian wildlife, especially hummingbirds and of course, butterflies – Coconut Creek being “The Butterfly Capital of the World”. The 23kW solar photovoltaic canopy arrays on the parking roof deck provide enough power to supply 3 to 4 average Florida homes. This renewable energy source provides many times the energy needed to power the pumps, filters and lighting for the Sculptural Biofiltration Wall; the remaining electricity helps to power lighting and elevators within the parking structure. The solar canopies are also the source of the harvested rainwater. All of the project lighting is energy efficient LED lighting. The Sculptural Biofiltration Wall was a part of both the fulfillment of the public art ordinance requirements for the City of Coconut Creek, an element of the parking structure aesthetic enhancements, and an aspect of the City’s request for a ‘conspicuous display of green technology’ as a part of approvals for the overall project. A large display adjacent to the wall explains how this ecoart project merges art, science and engineering to regenerate damaged ecosystems. An article about the project by the Seminole Tribune can be read here. Singer Studio Team: Jason Bregman, Jonathan Fogelson and Alan Chapman. and Brian Beaulieu at Colby Co Engineering.